Town in the province of Palermo, set in a panoramic position overlooking the Conca d'Oro (Golden Shell), Monreale began to develop during the late Middle Ages, around the complex of the Cathedral, built by Guglielmo II, between 1172 and 1176. It is massive and regular in shape, an aspect which is further stressed by the two powerful bell-towers. The façade is embellished with a complex series of decorations. The portico, indeed, is an XVIII century addition. The porta Regum, which is the main door of the Cathedral, is an adrnirable work in bronze by Bonanno Pisano; it is signed and dated 1186. The other door, on the left side of the Cathedral, is by Barisano da Trani. The walls are entirely decorated by a splendid series of mosaics which constitutes the most complete cycle of mosaics in the Byzantine tradition. The mosaics in the apses, with stories from the Gospels and the Acts of the Apostles, culrninate in the great apsidal cupola, with the majestic figure of Christ Pantocrator. In the left part is the 17th c. Chapel of the Crucifix, splendidly decorated with variegated marbles. There is a l5th c. crucifix over the altar. Also noteworthy are the two statues of Ezechiel and Daniel by Baldassare Pampillonia, a 16thc. Gaginesque marble ciborium, and the bronze gate that closes the chapel. From here we enter the Cathedral Treasury which displays among other things a number of reliquaries, church omaments and vestments, pyxes, chalices, and a walnut sacristy cabinet (1690). To the right of the sanctuary are the tombs of William I and II, the latter remade in l575. 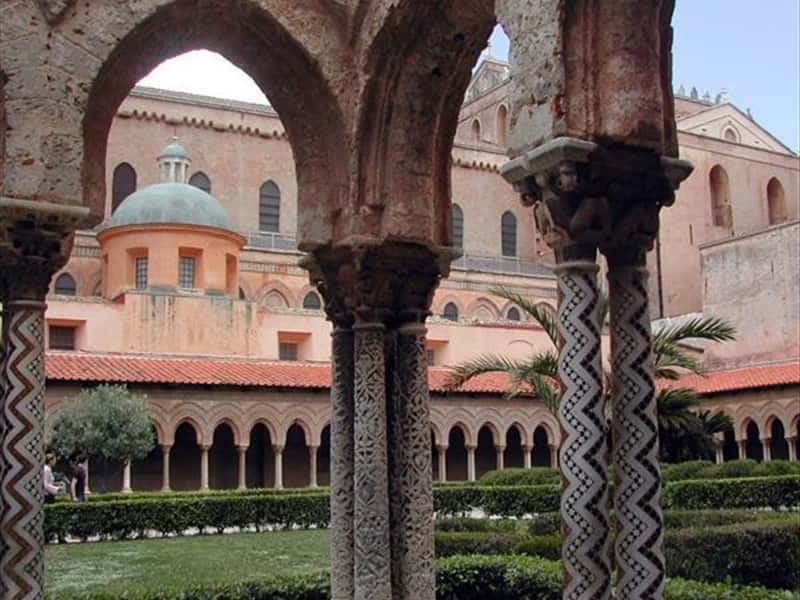 The Cloister is an admirable construction, square in plan, with small columns supporting elegant pointed arches. We also suggest to visit the Town Hall (XVIII century), the Collegiata Church (XVII century), the Church del Monte and the Civic Gallery of modern art. This town web page has been visited 18,697 times.